Author Paul Tremblay recently posted Lovecraft’s notes for his novella At the Mountains of Madness on Instagram. A bit of Google searching led me to this article at Slate from 2013, which you can read for more details. Below is a large version of HPL’s notes. Enjoy! Please use the Lovecraft eZine‘s Amazon Portal for all your Amazon purchases — it supports the site, and doesn’t cost you an extra penny! As a dyed-in-the-tentacle Lovecraft fan I enjoy the hell out of your site. Ia! “Storm-blasted pictographs!” Brilliant, S. Smith. Can you imagine how some of his correspondents must have felt when they saw book-sized missives in his crabbed handwriting landing with a gigantic bloody thump through their letter-boxes — if they could even fit in, that is. 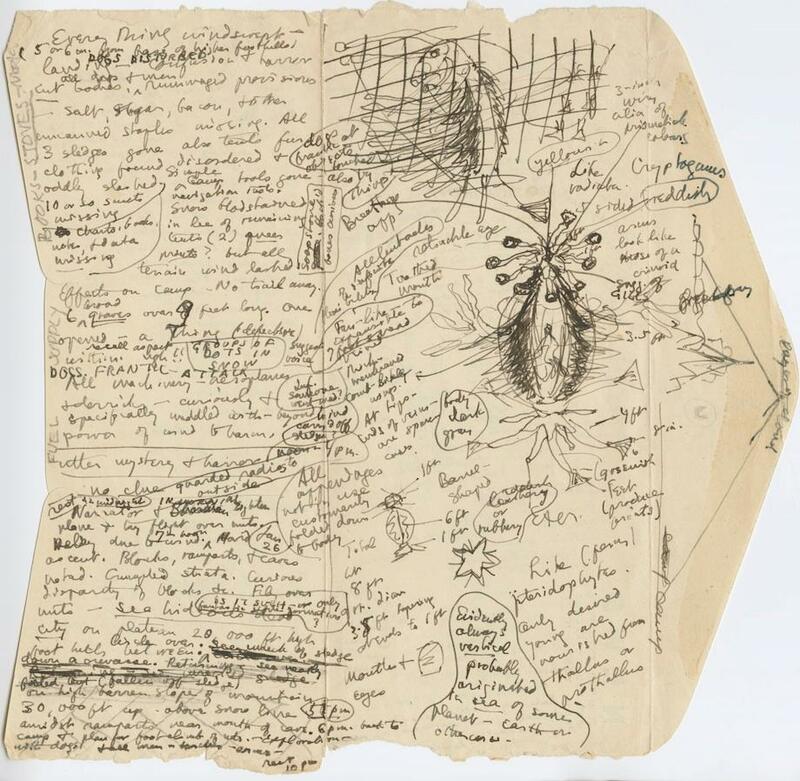 A Lovecraft brainstorm that became the core of “At the Mountains of Madness”, How awesome, because if you write at all, you know the creative buzz that seized Lovecraft as he jotted all this down. Thanx to all of you for furnishing us that image. “At The Mountains of Madness” was on of the first bits of Lovecraft I read, along with “Whisperer In the Darkness”.